Remember the days when you traveled on a school bus. Those days are back, come travel with us on our clean bus. 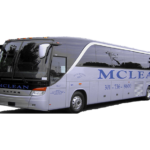 Travel to all the hot spots, using McLean Bus enjoyable fun fill fleet of buses.